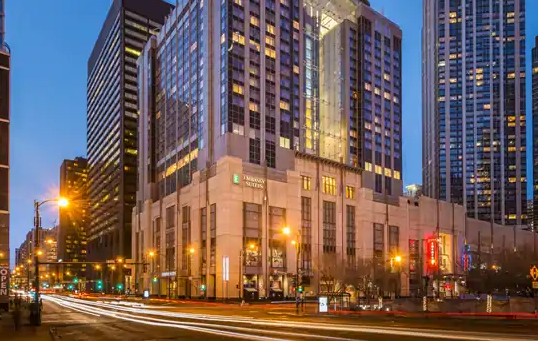 Located in the heart of Chicago's finest attractions, Embassy Suites Chicago Downtown Magnificent Mile welcomes you to our sleek and upscale AAA 4 Diamond hotel. This hotel, with spectacular views of the downtown area, provides you with a sophisticated experience and more space to unwind and be yourself. We offer 455 spacious two-room suites. Each one features a private bedroom and separate living area and includes two 48-inch TVs and a kitchenette with refrigerator, microwave and coffeemaker. Staying at the Embassy Suites during the conference means you'll be at the hotel along with the rest of the attendees, making it easy to meet up after the event ends for the day. Book your room before it's all booked up for the event dates! The room block deadline is Sunday, April 7. NOTE: Terrapinn will NOT contact you by phone asking you to book a room. If you receive this kind of phone call, please HANG UP, do not agree to book and do not give over your credit card details. If you receive an email about booking your room from an address that does not end in @terrapinn.com please ignore it. EXHIBITOR HOUSING SERVICES are NOT associated with our company or our events.